Though you may not know it, your kitchen is likely home to several different Chinese herbs. In this entry we will highlight the wonderful herb, ginger. Ginger, the rhizome of the plant Zingibar Officinale, is an herb native to Southern China. It is an aromatic, spicy herb that is considered warm in TCM. In Chinese medicine three primary forms of ginger are used: sheng jiang or fresh ginger, gan jiang or dried ginger, and pao jiang or quick fried ginger. Each of these forms imbues the herb with different properties. Fresh ginger, which is likely the form you have in your kitchen, is used to fight colds and flus that are marked by chills. It helps warm the body and promotes mild sweating, which can help relieve symptoms. 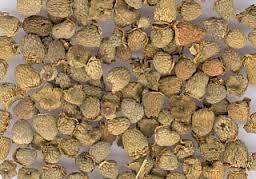 The herb is also well-known for its ability to relieve gastro-intestinal disturbances. It is safe for use during pregnancy and is often utilized for its ability to help with morning sickness. Historically, its use in many seafood dishes is due not only to its delicious flavor but to its ability to prevent seafood poisoning. Recent studies have shown that ginger contains anti-inflammatory properties that help relieve arthritic pain. Of the countless ways to use ginger, the easiest is making ginger tea. Simply remove the skin, toss a few pieces in a pot, and boil. It can be drunk as is or you can add lemon and honey to mellow the strong taste. Enjoy! This came to me from a chef in San Francisco. I have always heard to just take a knife to peel ginger. Though I patiently (sometimes) peel my ginger, without fail I end up losing a ton. To save time and ginger, use the side of a spoon and scrape the outside. The skin comes off quite easily and there is no loss of ginger!